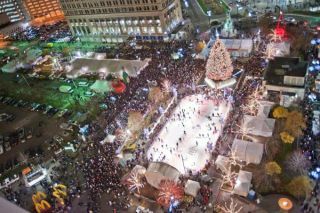 Christmas was dazzling in Detroit's Campus Martius Park where High Resolution Systems' UDC Pro ECS-Raptor, a UDC Pro Embedded Control Server for AV installs, played in a key role in the holiday festivities. Raptor was a new addition to a systems upgrade to the park that was done by Advanced Lighting & Sound. Campus Martius Park is a 2.5-acre public square and year-round entertainment venue at the crossroads of downtown Detroit. This Christmas the park was significantly brighter than in past holidays with more than 19,000 multicolored LED lights on the city's official Christmas tree and 142,000 more LED twinkle lights on 80 trees throughout the park. The "Light Up the Season" ceremony marked the tenth anniversary of Christmas tree lighting in the park and the kick off to Detroit's holiday season. The 60-foot Norway spruce sat atop the park's fountain; live music and skating performances on the rink adjacent to the tree entertained the crowd. The Ikea D-Light! Presentation was a five-minute track of Detroit artists performing classic holiday songs synchronized to the Christmas tree's blinking, dancing and sparkling LEDs; it played at scheduled times throughout the holiday season. Troy, Michigan-based Advanced Lighting & Sound performed the initial AV install in the park in 2005 and returned to upgrade the space last year as the park expanded into the adjacent Cadillac Square. "The original control system utilized Flash as the programming language and ran fine in a PC environment but didn't play well with iOS devices," explains Bob Sullivan at Advanced Lighting & Sound. "With the park expansion we needed to add more control functionality. Since we were going to completely reprogram the system we decided to find a controller that would play nice with all the devices and be easily updatable as things changed in the park." screens because all of the staff had become very familiar with it. They wanted to be able to use a variety of devices to control the system and have the flexibility to add control points as needed. So we installed a Raptor control processor along with a variety of Global Cache devices to interface with the other equipment in place." iOS app available in Apple's App Store; the HRS Control Pro app for any Windows tablet; in-wall mount touchscreen and button solutions; Android tablets; and web servers. Any device with a browser can act as a controller. function to their unit that automatically drives a variety of events in the park based around sunrise and sunset. Their ability to make these changes in the software in days instead of weeks or months made the change possible." Sullivan says he's using an array of contact closures to control a Square D lighting panel controlling the park's lights. "We also control a few cable boxes through IR, which allows for music playback and channel selection for a pair of flat-screen TVs in the restaurant window. All video control falls under a Kramer serial router." volumes for all the sources and speakers through serial control,"Sullivan explains. "Raptor serial control is also used for the lighting system controlled by Martin LightJockey software." system with a simple user interface that allowed us to make changes if needed. After just 30 minutes on the software I was able to create new pages and functions, which is huge." positive," says Sullivan. "Everything looks familiar to them and functions as they wanted." with another Michigan-based company - we're located about 10 miles from each other," Sullivan notes. "Their attention to even this small project was great, and we look forward to other applications for their products and services."